You played all weekend, but it's back to work today. It can be tough to walk the line between your sensitive feminine side and the assertive side that makes your male coworkers respect you. Somehow you do it, though, and fabulously. Remind everyone of your balancing skills today in a pair of high heeled oxfords, like these ribbon-laced shoes from Alberta Ferretti. The cream color signals the start of spring, and the menswear inspiration in the patent leather details references your toughness. 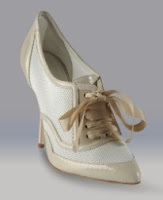 However, the delicate 4.7 inch heel and grosgrain ribbon shoelaces are undeniably girly. They'll look amazing with frilly frocks (like the Eliza J Women's Ruffle Front Shirt Dress ), pencil skirts or pants suits. Early Spring is the time to switch from dark liquor to light. However, you can cross over slowly. That's why it's the perfect time for a "Brandy Alexander" (recipe & image courtesy of 3scocktails.com). While it's made with Remy Martin Brandy, it's mixture of creme de cacao and heavy cream give it a light, seasonal color. It will definitely have a kick, though, so if you're a lightweight drinker go slowly.